For a quintessential American experience, Chicago delivers. This Midwest city is charged with entertainment and activities that will keep you busy for your entire honeymoon. Couples who’re looking for a bustling city that has a killer music scene should plan a Chicago honeymoon. The Windy City is a fabulous destination for music fans, because it hosts several different festivals and concerts each year—like the popular Lollapalooza festival and Chicago Jazz Fest. Foodie couples will also love a Chicago honeymoon because the city is filled with Michelin star restaurants. From international cuisine like Polish pierogies to the city’s world renowned Italian deep dish style pizza, Chicago is a mecca for good eats. 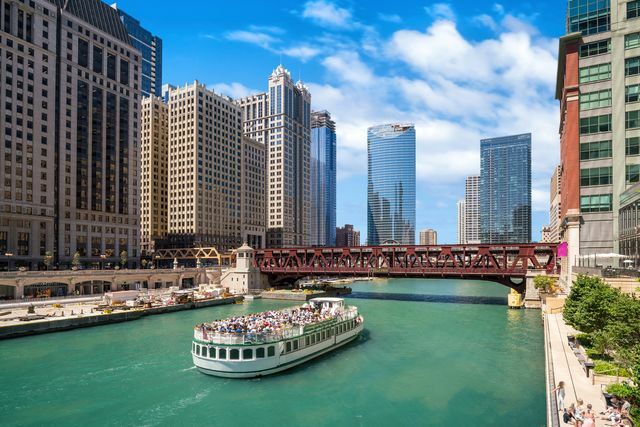 Along with having a vast amount of restaurants and festivals, The Windy City is also home to museums, parks and iconic sky scraping buildings. So, if you think a Chicago honeymoon sounds like the perfect trip for you and your partner, we’ve got you covered. Keep reading to learn all of the top things to do and see in this American metropolis. Use this helpful guide to plan an unforgettable Chicago honeymoon. The best times to take your Chicago honeymoon are April through May and between August and October. Temperatures are warm during this time and this is when most of the concerts take place. If you’re planning to visit during the middle of the summer, make sure to pack accordingly because the weather can be very hot and humid. As for the winter months, couples should expect a fair amount of snow and colder conditions during this time. Grant Park: Check out over 300 hectares of lakeside park during your Chicago honeymoon. Grant Park is also nicknamed Chicago’s front yard. Dinner Cruise on Lake Michigan: Admire the iconic skyline over a romantic dinner. Cloud Gate: Spend an afternoon visiting the iconic ‘Bean’ located in Millennium Park. Navy Pier: Take a romantic Ferris wheel ride and watch fireworks in the summer. The 606: Active couples will love using this network of bicycle and walking paths that include art installations along an old railway. Wicker Park and Bucktown: If you're looking for culture, nightlife, culinary and an arts scene, just check out these two Chicago neighborhoods. The Chicago Theatre: Historical landmark theatre where a variety of shows are presented. Baseball Game: Sports fans will love going to one of Chicago two baseball franchises, the White Sox or the legendary Cubs team at Wrigley Field. Skydeck: Glass bottom floor at the top of Willis Tower, formerly called Sears Tower. Monroe Harbor: Over 800 mooring cans located steps away from the city, offering stunning lake views. Art Institute of Chicago: One of the United States of America’s largest, oldest museums. Deep Dish Pizza: This Chicago classic can be enjoyed in a number of reputed restaurants and is definitely a must-try during your Chicago honeymoon.